Mid Day Meals timings during Half Day Schools: Mid Day Meals(MDM) timings during Half Day Schools, MDM timings during Half day schools,Serve MDM at 11.00 AM during Half Day Schools: The Commissioner and Director of School Education issued on April 6th, 2014 certain instructions for Change of Mid Day Meals timings during Half Day Schools through its DSE Office Official Proceeding Rc.No.55, Dated.14-03-2016. The Commissioner and Director of School Education instructed to all the District Educational officers in the State to Change MDM timings during the half day Schools to 11.00 AM and For the schools where exam centre for SSC exams are there, the MDM is to be served before starting of school i.e., scheduled fro 1.00 to 5.00 pm working hours. 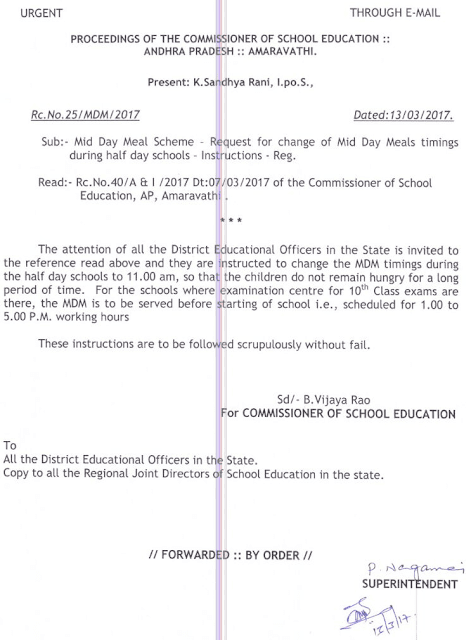 Subject: Mid Day Meal Scheme - Request for change of Mid Day Meals timings during half day schools Instructions - Reg. All the District Educational Officers in the State are informed that the functioning of Half Day schools is scheduled from 13-03-2017. In this connection they are instructed to change the MDM timings during the half day schools to 11.00 am so that the children do not remain hungry for a long period of time. For the schools scheduled for 1.00 PM to 5.00 PM working hours in view of they being examination centre for 10th Class examination, the MDM is to be served before starting of school at 1.00PM. These instructions are to be followed scrupulously without fail.